The latest triumph from visionary director Robert Zemeckis, arriving thirty years after his iconic Back to the Future trilogy, The Walk continues his winning streak of pushing to the cutting edge of what’s possible through visual effects, to craft a thrilling big screen spectacle built around an incredibly human story. The film recounts the fantastic true story of Philippe Petit (Joseph Gordon-Levitt), a young street performer from Paris, who realized his seemingly impossible dream of hanging a high wire between the Twin Towers when the buildings were finishing construction in 1974, and performing atop it for the crowds below. The first act introduces us to the colourful cast of characters who aided Philippe Petit on his mission, including a motley crew of accomplices in the form of his mentor Papa Rudy (Ben Kingsley), girlfriend and fellow street performer Annie (Charlotte Le Bon), photographer Jean-Louis (Clément Sibomy), and severely acrophobic Jeff (César Domboy). The second act plays out like a heist, with a lot of great humour as they figure out ways to get into the buildings through elaborate disguises, and smuggle in all of the equipment needed for the actual high wire act. Then we get to the last act, which puts us right on that wire with him, using 3D to aid its storytelling, and made to be experienced on the biggest screen possible. This pulse pounding and visually stunning sequence thrillingly recreates every single step, through spectacular cinematography and seamless visual effects that bring the Twin Towers to majestic life once again. They are such a major presence in the film that we actually forget they are merely recreations built on sound stages and digitally enhanced through computers. As the camera swoops from the top floor to the ground below, the buildings appear to tower over the screen, capturing a feeling of immense height as we peer over the edges of the roof. This final stretch proves that Robert Zemeckis still has just as much of a golden touch behind the camera, allowing him to play around with one of his largest visual effects toolboxes, and conjuring up some of the most breathtaking and unforgettable moments of any film this year. The filmmaker also makes sure that there is a beating heart behind these images, and does a beautiful job of crafting this larger than life story into a timeless fable about never giving up on your dreams, no matter how wild they might seem. The music by his frequent collaborator Alan Silvestri is another soaring example of the composer’s ability to provide sweeping accompaniment to visual set pieces. Joseph Gordon-Levitt transforms into this role through dyed hair, blue contact lenses and a thick French accent, and does an excellent job of carrying the film, believably portraying his character’s passionate and almost obsessive determination. The actor also spent time with his real life counterpart, who trained him in the art of the high wire, which adds another level of authenticity to his performance. The rest of the cast, from the main supporting cast to the bit players, do a great job of fleshing out the world of the film, including scene stealing work from Ben Kingsley. Narrating from atop of the Statue of Liberty, Philippe tells us in the opening scene that he hates the word death, and refuses to use it throughout the rest of the film. Although the events of 9/11 are never mentioned, despite that tragedy often being at the forefront of our minds, The Walk beautifully eulogizes the Twin Towers, by recreating a moment when these buildings were still in their infancy and suddenly came alive. The film understands that this high wire act was a feat of soaring bravery, and rebellious moment of artistic expression, that was profound in what it came to represent. 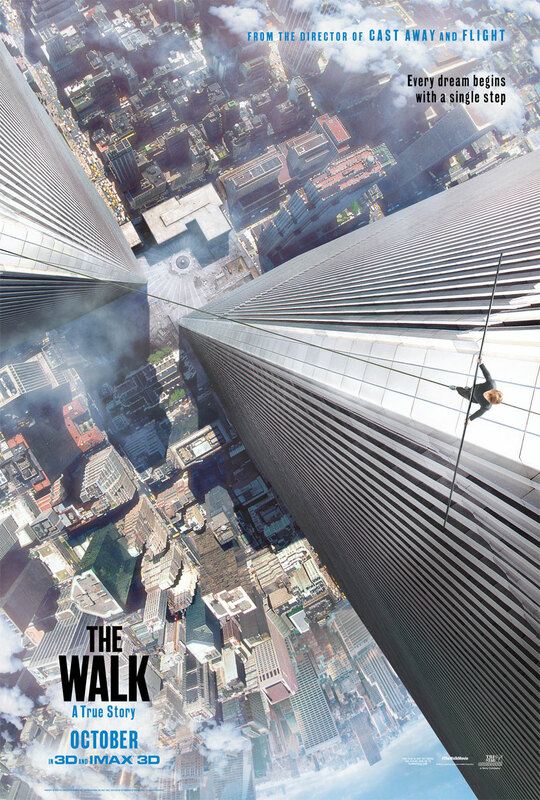 The Walk is a pure cinematic journey, an exciting and surprisingly moving visual thrill ride, building towards a masterful display of movie magic that keeps us firmly on the edge of our seats, and is made all the more powerful for its quiet moments of reflection and cathartic emotional release. But the greatest feat of all is how the film makes the Twin Towers rise again, making us feel nostalgic for a moment in time when anything seemed possible, and bringing us the closest we will ever get to experiencing what Philippe Petit would have actually felt on that wondrous morning amongst the clouds.